Last week we’ve been to SF’s Chinatown, dine in great Chinese restaurant. Two white guys next to me got their fortune cookies. I smiled to my husband with the ‘dessert-smile’ a.k.a. creepy sugar-wanting face, finished my food and waited for my cookie. We went out and 10 minutes later I’ve realized I didn’t get my cookie. If I wasn’t so lazy I might even went back. Yup, your man defines you. But what’s the whole thing with fortune cookies? What really surprises American people going to China or Hong Kong is that they don’t serve you one at the end. Maybe because a lot of them don’t even know what’s that. It’s not a Chinese thing, doh – it’s not even truely American. Fortune cookie is based on Japanese recipe. Maybe I wouldn’t be so into the fortune-cookie thing if we didn’t have one of the biggest factory quite close to use. 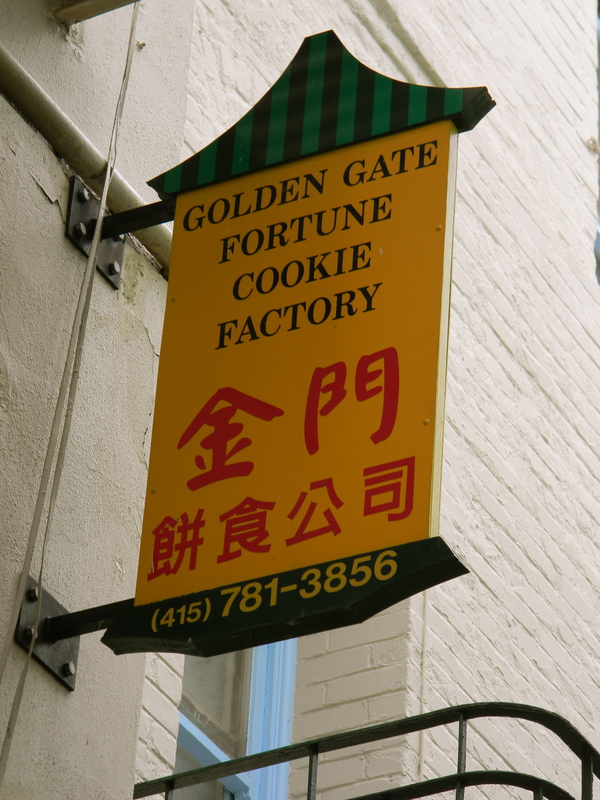 Golden Gate Fortune Cookie Company was established in 1962, they make traditional fortune cookies, as well as chocolate flavored fortune cookies, almond cookies, and other sweets. Visitors can observe workers using motorized circular to create fortune cookies, which they sell for $3 a bag. The company also makes fortuneless cookies. I guess jokes ‘Help! I’m trapped in a Chinese fortune cookie factory‘ might not be so funny there. ‘It was my first time to America, I went with my friend to eat Chinese food and got a cookie. I didn’t know there’s a thing inside so I ate it. My thought was ‘Wow, what a bad quality, they even have a piece of paper inside’ and American guy next to us asked me with shocked face ‘Why you eat it like that? It’s fortune cookie, invented by you! You don’t have it in China?’. Not the best experience. Does it suit my taste? Nope, it’s not a kind of the dessert I like. Besides I love the way Chinese people separate dessert from the main meal, they have their own dessert place, not like most ‘white’ places: appetizer, main course, dessert. Cannot fit all of that into my stomach at one meal. For Chinese restaurants ‘dessert menu card’ doesn’t really exist. You eat, hang around then get some boba milk tea and pineapple bun. Have you ever tried a fortune cookie? Did you like it? Any memorable fortune waiting for you? Share your experience and feelings about American-Japanese-Chinese child of desserts. They’re OK. Nothing great. I knew they were a sort of western invention from a first generation American girl of Chinese ancestry who would buy them by the cheap reject bags, just to snack on. I had my first fortune cookie at a Chinese restaurant in SF – and they are only available in US. It is so much better with a piece of fresh fruit at the end of the meal. Even more so when there is complimentary soup at the beginning of the meal. I admittedly only break open the fortune cookies for the fortune and throw away the cookie. 🙂 I would much rather have an orange slice or other fruit after dinner. I’m from Seattle. But three weeks ago we were in SF for my nephew’s wedding. The next day after lunch in Chinatown with another nephew, we stopped by that fortune cookie factory and my daughter bought a bag of cookies. Actually, I like fortune cookies. One cookie is just a little taste of sweetness after a meal. Chocolate mousse or key lime pie might be more delicious, but who can eat so much at the end of a meal? Now that you have me thinking about desserts: Have you ever had sans rival or the kind of mango pie they make in the Philippines? Yum. I visited this fortune cookie company when I was in San Francisco, too. Thanks for the like! I saw a short film about a fortune cookie once that reconciled a bickering couple because the guy writing the fortune wrote it specifically for them. Very cool. I also break them open, read the fortune, then throw it away. A friend of mine once got the fortune: You like Chinese food. Awesome post. When my husband first ate a fortune cookie, he accidentally ate the fortune. He said, “Why it taste so strange?” (he spits it out and saw the paper). I don’t really like fortune cookies. I’d rather have a real dessert such as homemade hot apple pie. Mmm!. I lived in LA for a few years. When I first got there I was like what the heck is a fortune cookie? And why is there teriyaki chicken and curry at a chinese resto?! Sure I might occasionally have a fortune cookie…it’s like having a wafer or cracker to me. It’s kind of tasteless to me. I was born in Canada and lived here all my life. But yes, I am aware it’s not Chinese. Saw the comment from chennicole2013 about sans rival in the Philippines. They make them in the province where I come from. Really good. You can also try buko pandan salad. I like buko and pandan–never tried them together. Sounds good! Sans rival is heavenly. Which province are you from? Fortune cookies are a funny thing indeed — nice post, Lina! You might be interested also in the book “The Fortune Cookie Chronicles” which traces the history of these (and other aspects of Chinese food in the US). The day before I left the US for my current 5 month trip in Asia I went out with some friends for a Chinese food lunch. When I received my cookie at the end, I cracked it open and it was empty! A bad omen? Or just a lack of quality control? 😀 I will go with the latter! My friend, who likes to put a positive spin on everything said that it meant “infinite possibility” Great post!